Everything in the world are creations that God has created. The important substances that form the earth are water, soil, and rocks. Among them, rocks have been considered to be something useless in the old days. However, as human civilization began to advance, rocks have become real gems, an indispensible part of human race. It is said that humans are as common as rocks. That is why we humans sometimes feel that we are useless in this world. But the truth is, even those rocks, which are extremely common, shine if they are being used. The Holy Trinity, the omnipotent beings, have come to us who are as common as those rocks and have invited us to Heaven. In leading Providence, I have preached the Word that God has given me to countless people who have lost their direction in life and are disheartened and wandering. People were crowding in and I felt so guilty about serving my beloved God in a small rented church. In leading Providence, I have preached the Word that God has given me to countless people who have lost their direction in life and are disheartened and wandering. People were crowding in and I felt so guilty about serving my beloved God in a small rented church. In the old times in Jerusalem, Jesus preached his Word in places like the Mount of Olives or the Sea of Galilee where many crowds could sit comfortably and worship and give glory to God, I too prayed to God for a big place like that in nature. At that time, God answered me and told me that he will give it to me. Later, God and the Holy Son permitted it by directing me to my hometown. At first, God had my younger brother, Bumseok Jung, develop the Natural Temple into a training center and gradually, He made me realize about it more and more. 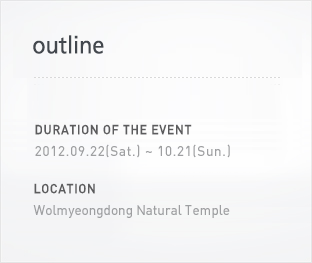 I thanked God who had permitted the construction of the temple, moved my ministry location from Seoul to my hometown, and started to build the Natural Temple. As I was praying to God about how I should develop this place, I saw a vision. Immediately, I started the construction exactly according to what God had shown me. Some of the best landscaping experts in Korea who we hired from outside gave up on the construction saying it was too dangerous. Because I had never done this kind of work before, I really didn’t know what to do. I was at a loss. Those were rocks an trees I thought were impossible to buy because I had no money. But because God was with me, all impossible things became possible. If God and the Lord had not been with me, it would have been impossible because I did not know the methods or principles of stacking rocks. Over many years, with help from the Holy Trinity, I, together with my disciples, was finally able to dedicate this magnificent, mysterious, and beautiful Natural Temple to God. There are stories of people in this Natural Temple. However, more than 80% of the stories are the stories between God, the Holy Son Lord, the Holy Spirit and me. There is not one rock that doesn't have a story. Because it had stories involving God, it became a place of God’s history. Because God gave me an inspiration to hold a rock festival annually, I wanted to give glory to God. That is why we came to hold the rock and the natural environment festivals. I urge all of you to come, see the magnificent, mysterious, and beautiful site that God has worked upon, and realize how God is alive and working among people. Only when you come and see yourself will you encounter God. Only when you come and see yourself will you encounter God. Magnificent rocks will inspire your hearts. They will shout and speak of the words that testify about God. Likewise, a new living history of faith has started in order to give people eternal hope by developing and changing their lives through the Word of God. And from this place, it is spreading out to many nations of the world. 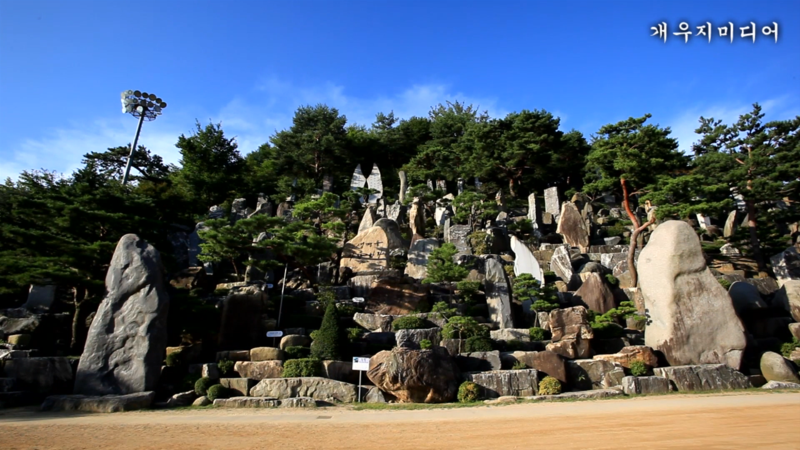 All of you who are visiting Wolmyeongdong, all the rocks in the beautiful rock garden symbolize people. Whether the rocks are small or big, they shine by doing their jobs. Likewise, there is no one who is not needed by God. If you would just accept God’s invitation, God will make your lives into radiant lives like those rocks in The Natural Temple. Everyone, please entrust your lives to God. I pray that, through the Holy Spirit, you will be filled with abundant blessings of God and the Lord in your days ahead. I bid you peace.